Instances of extreme temperatures and hurricanes are increasing in number and frequency. Polar ice masses are withdrawing further, rising sea levels are flooding first inhabited islands in the Pacific. Climate change is threatening mankind. What do two degrees Celsius of global warming mean and what happens when we exceed them? Poets react to these facts. 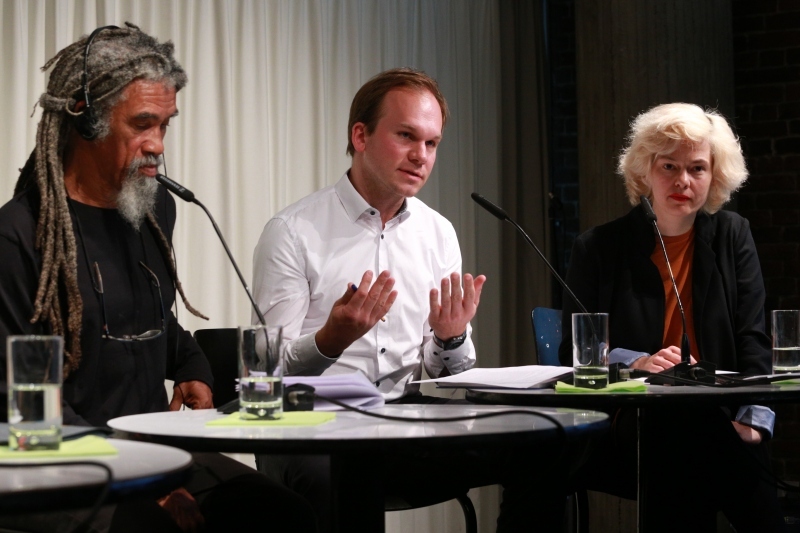 At the 19th Poetry Festival Berlin, poets talked together with Daniela Seel (editor and poet) and Arne Riedel (Ecologic Institute) in a "Poetry Talk: World Climate Summit of Poetry". The discussion touched upon the potential of poetry to connect people emotionally to climate change and how it can generate attention for this topic. Tsead Bruinja (Netherlands), Imtiaz Dharker (Pakistan), Kendel Hippolyte (St. Lucia), Jessie Kleemann (Greenland) und Outspoken (Zimbabwe) introduced excerpts of their works and reflected on their insights into the consequences of climate change on people and nature. In the discussion, moderated by Daniela Seel, Arne Riedel connected the international climate negotiations with these changed realities: A flexible international legal framework would be necessary but would also need to be filled with specific approaches and solutions on the national and local levels.